Some business people spend hours trawling through analytics data in a bid to find out exactly how people are using their online presence. The idea is that by understanding this information a business can tailor-make a more precise web experience for visitors, thereby increasing the likelihood of sales. It makes sense. Well, it makes sense if the data you get from analytics is true. A lot of the time it is not. As anyone who has used dual analytics systems in a bid to compare things will tell you, the data from one system is often at complete odds to the information coming from the other. Most people trust Google Analytics – even though there are 14 reasons why Google Analytics could be wrong. Much of the data businesses are analysing is false – either because they haven’t set things up correctly, or because the system is failing them. New research now shows up another potential failure. Businesses are keen to know how their material is shared, where it is shared, who shares it and when. Several studies have shown that most material is socially shared on Facebook, hence businesses are piling in their resources to get more of their content shared on that social network. The problem is, that for businesses on Facebook the company limits your potential reach to just 9% of the people who have liked you – their aim is that if you want to reach the other 91% you have to pay for it through a sponsored post. All around the world, businesses are looking at their potentially false Google Analytics reports, getting amazed at the amount of sharing via Facebook and then spending hours on producing Facebook content for a mere 9% of their target market. Madness. New research shows that three-quarters of everything that is shared is done in the “dark social” sector – sharing that is hidden from analytics, such as email or instant messaging. It means that if you are trawling through your analytics to see how you can get more stuff shared you are only looking at a quarter of your information – and then you are probably using that 25% of data to feed just 9% of your potential market. 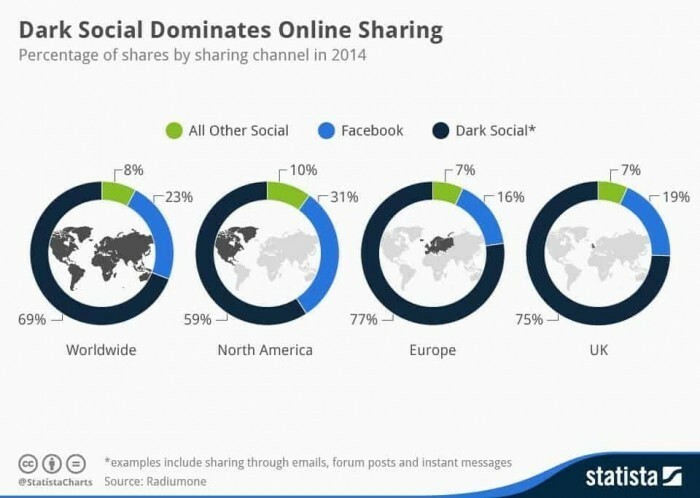 What this data really suggests is that we need to find ways of ensuring that people can share our content using email. You might have sharing buttons on your website for Twitter or Facebook, but it looks like you’ll do much better as a business if you have an email sharing button too.